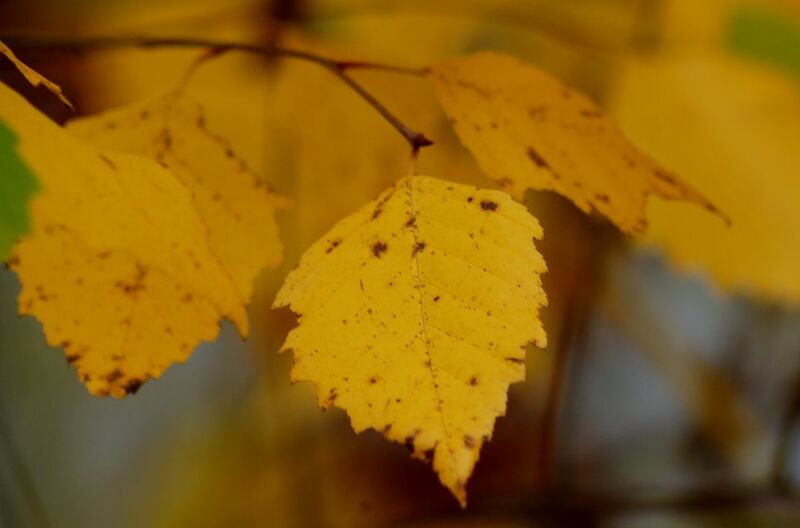 Betula species such as river birch trees (Betula nigra) are among the best selections for fall foliage specimens. But the birches boast other traits, too, that will catch the attention of homeowners seeking year-round interest in the yard. Learn about several members of this species that you may want to grow if you value beautiful, versatile trees. "River" birch is called so because, in its native habitat, it is often found growing near rivers. An alternate common name is "black" birch, which is reflected in the species name, nigra (Latin for "black"). This is a reference to its bark, which starts out salmon but turns darker as it matures. The fall foliage color is yellow. River birch trees can be grown in planting zones 4 to 9. Native to the Eastern U.S., they will reach a height of 40 to 70 feet with a spread of 25 to 35 feet. They can be multi-trunked trees or grown so as to have just one trunk. These specimens are full-sun trees, but they will also tolerate partial shade. The trees' peeling bark is as attractive as the fall foliage. They shed their bark like the paper birches. River birch trees tolerate the summer heat better than paper birch trees, meaning they are better suited to grow in warmer regions. They are also more borer-resistant than most birches. Another birch tree grown as much for its peeling bark as for its fall foliage is the paper birch (Betula papyrifera). Its fall foliage color is yellow. The chalky bark, or “paper,” is more striking than that of the river birch trees, sometimes attaining to almost a pure white (which is why it is also sometimes called "white birch"). The bark of this tree is famous for another reason, too: as the material for birch-bark canoes. The fall foliage of paper birch trees is similar to that of gray birch trees (Betula populifolia). But gray birch trees grow in clumps, producing multiple trunks, and their bark, which does not peel, is not especially attractive. Grow these two trees if you live in Canada or in the northern tier of U.S. states (planting zones 2 to 6). They are native to this region, and they prefer its cool temperatures. Their height and spread are similar to that of river birch trees. Plant them in full sun to partial shade. Another “white” birch is Young’s weeping birch (Betula pendula Youngii), a dwarf variety that reaches a height of 6 to 12 feet at maturity. It can be grown in planting zones 3 to 9. In addition to its white bark and yellow fall foliage, the form of this tree provides landscaping interest. As suggested by its name, the branches of this birch tree droop, or “weep” down towards the ground. Plant it in full sun to partial shade. Its parent, Betula pendula, is the European white birch. Another of the attractive non-white birch trees is the yellow birch (Betula alleghaniensis). A tall tree (60 to 80 feet) with a spread of about 30 feet, it has yellow fall foliage. But it derives its common name not from the color of its foliage, but rather from the color of its peeling bark. This bark sheds like that of the paper and river birch trees. Speaking more accurately, the bark is silvery-bronze in color with hints of gold. Yellow birches should be grown in full sun to partial shade, in planting zones 4 to 7. Sweet birch (Betula lenta) has dark-colored bark. Both the foliage and the bark makes this specimen one of the fragrant plants. Grow it in zones 4 to 7 in full sun to partial shade. Most importantly, sweet birch bears a more reliably strong, golden-yellow fall foliage than most other birches (whose autumn leaves sometimes lapse into paler yellows). The plant grows to be 40 to 50 feet tall, with a spread of 35 to 45 feet. But do not settle for trees alone when it comes to growing plants for fall color, because there are plenty of shrubs and vines with fall color that give you additional choices (in fact, being smaller, such plants may be better suited to small yards).